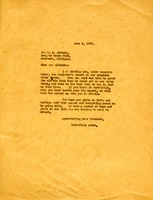 Mr. Liebold writes to Martha regarding the waterproofing and rubber tile and that he would most likely meet Mr. Carlson in some time in July at Berry. He also informs her that he leaving for Europe in September and will not return until around November. 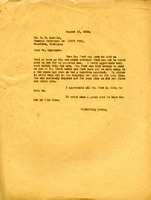 Berry writes to Henry Ford's secretary to inquire about a two-door car Ford had promised her while visiting the schools.